Recently I shared an 18thc painting of several fashionable folk consulting a pocket-watch with much the same intensity that people (fashionable and otherwise) stare at their iPhones and Androids. Turns out that this fascination with the newest technology is even older, and English diarist, administrator, and politician Samuel Pepys (1633-1703), left, was equally addicted in the 1660s. "The the 'Change [the shopping mall of Restoration London] and thence to my watchmaker, where he has put [my watch] in order, and a good and brave piece it is, and he tells me worth £14, which is greater. . . than I valued it....So home and late at my office. But, Lord! to see how much of my old folly and childishnesse hangs upon me still that I cannot forbear carrying my watch in my hand in the coach all this afternoon, and seeing what o'clock it is one hundred times, and am apt to think with myself, how could I be so long without one; though I remember since, I had one, and found it a trouble, and resolved to carry one no more about me while I lived." So even though all that Pepys's watch could to was tell the hour, he still couldn't help but check it repeatedly - and ostentatiously - throughout the day in a very smartphone manner. 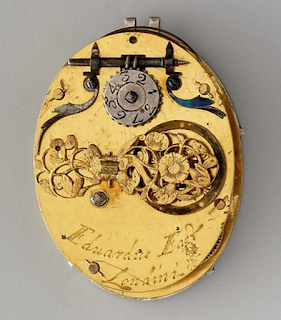 Unlike the ubiquitous smartphone, however, a watch was still a gentleman's costly status-piece, something that very few ordinary Englishmen would have possessed at the time. 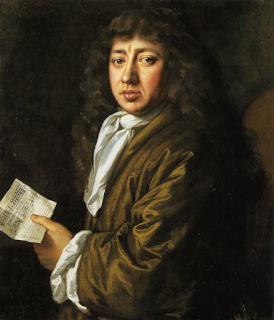 Pepys proudly states that his watchman valued his watch at £14. To put this in perspective, the average English laborer in 1670 was earning approximately £13 a year. It's impossible to know exactly what Pepys' watch looked like, but it was probably similar to the watch shown here, right. 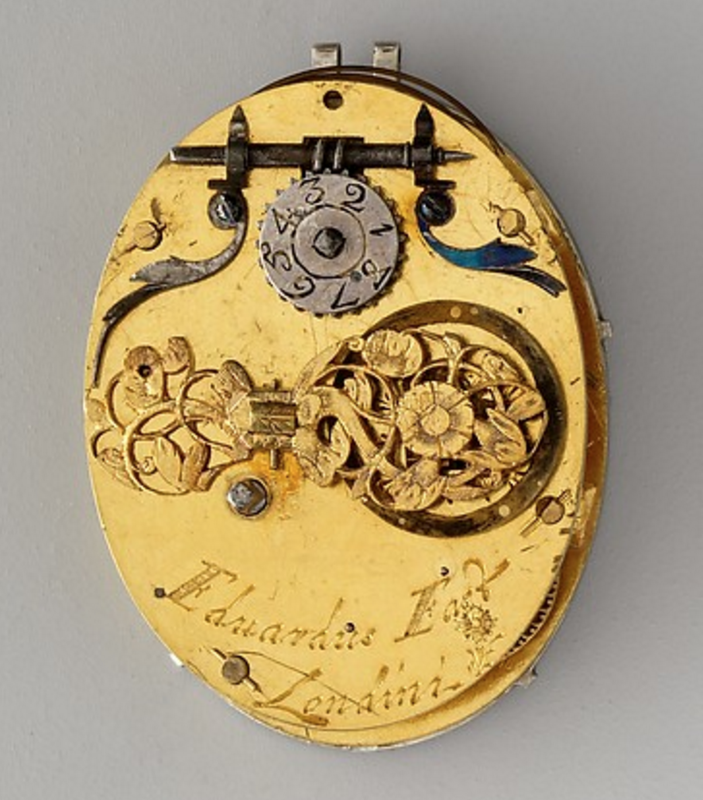 Made in London about 1640 by master watchmaker Edward East, it features outer and inner cases of silver and a movement of silver, steel, and gilded brass, with an elegant openwork floral design, lower left. Note that the watch has only a single hand, for marking the hour. The second, minute hand didn't come into use until later in the 17thc, when the accuracy of watches had increased sufficiently to merit it. This watch could have run as long as sixteen hours from a single winding, although in the course of that time, it could also be as much as several hours wrong. But for its day, it was a marvel. Just ask Samuel Pepys. Top left: "Samuel Pepys" by J. Hayls, 1666, National Portrait Gallery, London. 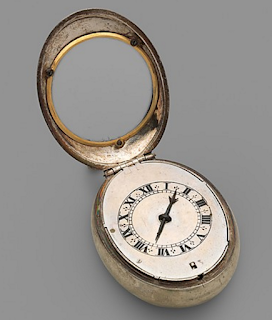 Lower right: Watch, made by Edward East, c1640, London. Metropolitan Museum of Art. It is possible that the earliest watches were so expensive and so inaccurate that people could not depend on them for telling the time. And sometimes they were also too big to carry around. So perhaps this accessory was more a sign of exquisite taste, modernity and financial spending power, than a serious time-keeper for the likes of Pepys. Was Pepys interested in promoting his reputation around town? It reminds me of Faberge' eggs with a clock in the centre. Spectacularly exquisite to look at and worth half the GDP of a small European nation, but oh what a gift from the Tsar to the Tsarina!! I couldn't help myself. 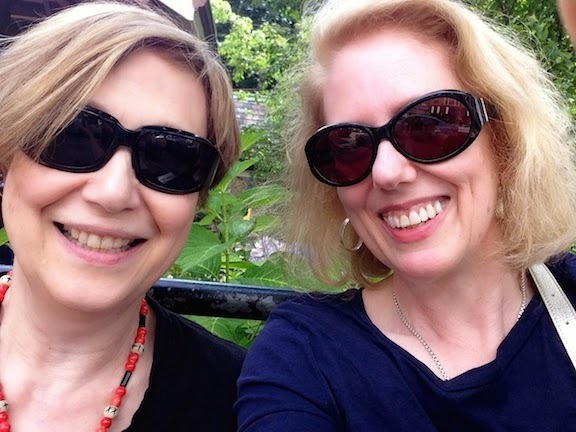 Hope you two enjoy this take on Samuel Pepys and modern technology.